LVMH hosted the awards ceremony for the second edition of The Cosmetic Victories at the Group’s Avenue Montaigne headquarters in Paris on June 22. Organized by the “Cosmetic Valley” competitiveness cluster, this competition recognizes projects that drive innovation in the perfumes and cosmetics sector. Alongside product safety, ingredient authenticity and protection of the environment, innovation, especially digital, is a cornerstone of the “Made in France” advantage championed by Cosmetic Valley. Cosmetic Valley naturally works to enhance this “magic square”, which both gives French cosmetics a competitive edge and creates intellectual added value. The perfumes and cosmetics sector is France’s second-largest net exporter and Cosmetic Valley bolsters this pillar in a fiercely competitive global market. 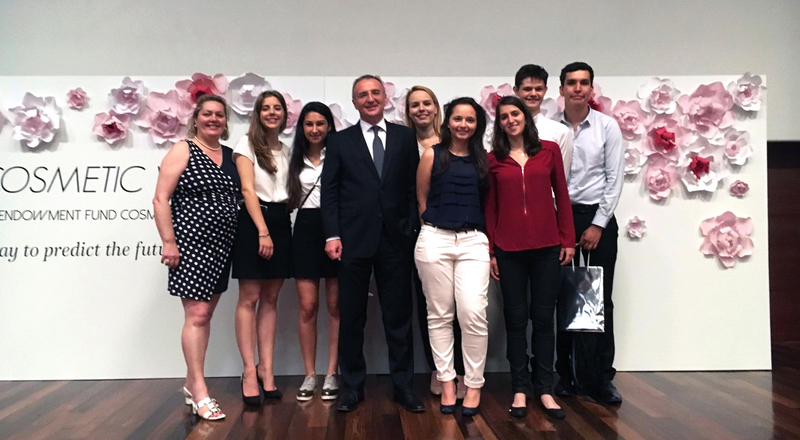 Created jointly through an endowment fund from Cosmetic Valley and the ESSEC business school, The Cosmetic Victories international competition targets two publics. The first is young researchers and students, including prominent universities who vie for the Academic Prize. The second is startups and small or mid-size enterprises in the cosmetics sector, who compete for the Industrial Prize. These unique awards address three priorities: identify innovative young firms, support their projects, and promote research in fragrances and the cosmetic sciences. Created in 1994, Cosmetic Valley was designated an official competitiveness cluster in 2005. With 800 member companies it represents 90,000 jobs and works with 220 research labs and eight major universities. It is a recognized hub and the world’s leading center for perfume and cosmetics production resources. LVMH General Secretary Marc-Antoine Jamet has been President of Cosmetic Valley since 2011, and several LVMH Maisons and entities are located there: Guerlain, Parfums Christian Dior and LVMH Recherche, the Group’s perfumes and cosmetics R&D unit. Created in 1981, LVMH Recherche enables LVMH Maisons to independently work on the formulations and textures of tomorrow. LVMH Recherche consolidated its presence in Cosmetic Valley in 2013 with the inauguration of Hélios, an 18,000-square-meter campus designed by Arte-Charpentier, dedicated entirely to perfumes and cosmetics creation and innovation. Several hundred applications were received for the second edition of The Cosmetic Victories. Sixty candidates were shortlisted for evaluation by a selection committee comprising prominent figures from the French and international cosmetics community, as well as qualified experts and representatives of leading establishments including French national research agency CNRS and Bpifrance, a French state innovation funding establishment. This jury awarded the Academic Prize to Plasmajets, a project created by CNRS research director Eric Robert in conjunction with Université d’Orléans labs. The winners received the award from Claude Martinez, CEO of the LVMH Perfumes and Cosmetics division, François Demachy, the nose of Maison Dior, and Olivier Echaudemaison, Creative Director of Guerlain makeup. PlasmaJets is a plasma-based device that performs anti-ageing treatment using cold plasma multijets. The Industry Prize went to the Zéo project created by Chloé Guérin and five of her second-year classmates at the Ecole de Biologie Industrielle in Cergy. Zéo is an absorbent powder that dries hair ultra-fast and naturally. The winners receive a grant of €10,000 and support for their project by the Cosmetic Valley competitiveness cluster, along with media coverage in French and international trade publications. They will also be featured at the Cosmetic 360 trade event this fall. Marc-Antoine Jamet (President of Cosmetic Valley and General Secretary of LVMH), Jean-Luc Ansel (CEO of Cosmetic Valley), Natalie Bader (CEO of Clarins), Bruno Bavouzet (CEO of LVMH Recherche), Patrice Bellon (President of the Société Française de Cosmétologie), Marie-Pierre Comets (Innovation and Business Relations Director, CNRS), François Demachy (Perfumer-Creator, Parfums Christian Dior), Simon Dufeigneux (Executive Vice President Public Affairs, Sisley), Daniel Guillermin (CEO, Shiseido France), Julien Morel (Executive Director of ESSEC Ventures), Laure Reinhart (Partnerships Director, Innovation Department, Bpifrance) and Axelle Tessandier (Founder of AXL Agency).